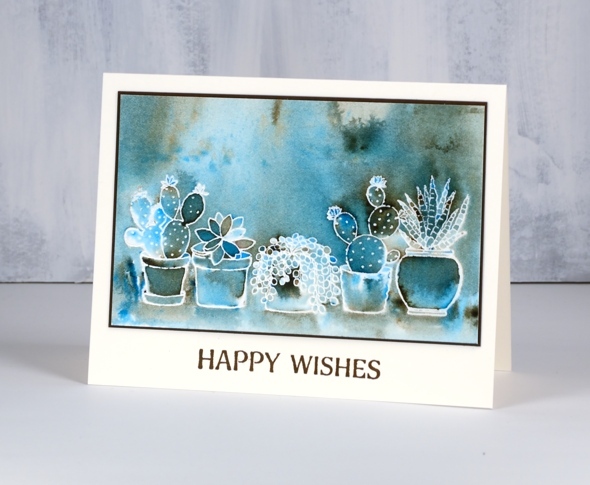 I am quite happy with the way these little cacti turned out using only one colour of bister paint powder. Bister can create surprising results. 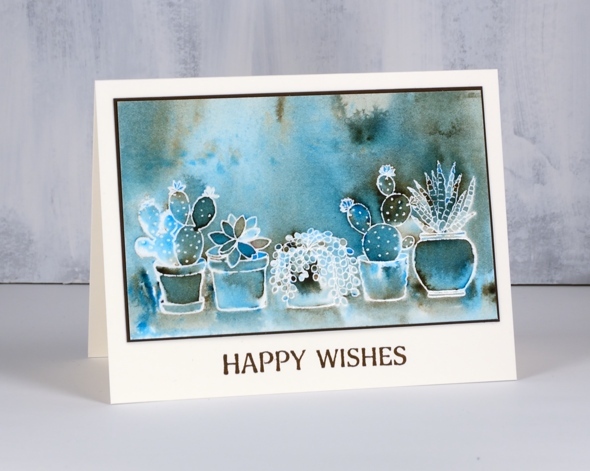 I used blue bister powder on hot pressed watercolour paper over clear embossing. Bister paint powders have an earthy tone to them which you can see clearly on this panel. I sprinkled blue bister over the panel and spritzed with water until the paint activated. I tilted and turned the panel until the paint pooled in certain places. Where there was very little colour I used a paint brush to transfer some from a darker area. Once there was good coverage I let it dry partially then picked up some brown from the panel and painted shadows below each of the pots. I matted the panel in brown and added the sentiment in vintage sepia versafine ink. I thought it was very cool the way all those leaf shapes in the second from left cacti turned out different colours. This is why I love playing with paint powders. This is so lovely – simple, understated and beautifully effective. What beautiful results you got with Bister! I must try this. simply stunning, Heather….you are truly a wonder!!! wow this is gorgeous!! never used bister powders. now I may need to! I tend to neglect mine in favour of brusho but when I do pull them out I’m so glad I did! I am such a fan of you and your cards, and I must say this moves into to top 5. So. darn. cool. Super-great card When you say “blister paint” do you mean Brusho? I’m confused (which isn’t unusual!). Thanks for sharing. Not brusho bit a similar product called bister. It’s a powder but coarser and earthier tones thank brusho. Glad you liked the card. Thanks – I’ll have to look for it, it is new to me. A really beautiful card Heather, I love it. You really excel at this style of card. Hi, Heather, I popped on over from SCS to see all the pretties you have made. And now I feel the need to try a Bister or two (or 3…) thank you — I absolutely love the browns that pop out in this blue! 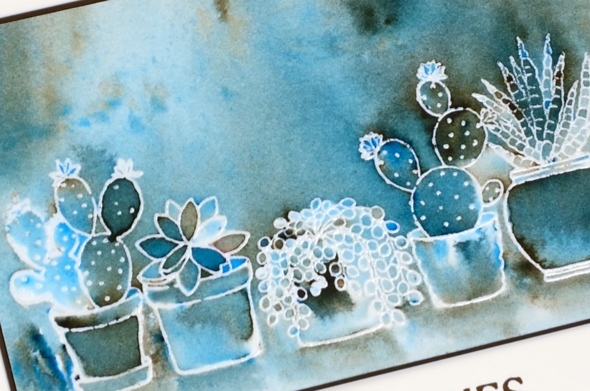 Using the clear embossing powder and then the cactus images is stunning! Love the colours and light shining through. I love this card! Thank you.